Sail4Syria signing out. / Sail4Syria fin. It is with sadness that we announce that we will not be continuing with the Sail4Syria trip. Due to various reasons (including logistical and financial) we have decided that is not sensible for us to continue the trip. We wish to say a big thank you to everyone who supported us on our journey. We could not have got anywhere without all the great help and support from so many different people. Thanks also to all the people who donated to Syrian Eyes . In total we raised £1692.06 for Syrian Eyes. In December we sent half of the money raised to Syrian Eyes (this was during the very harsh winter storm in the Bekaa Valley). We will be sending the remaining funds shortly for their ongoing needs. Maria Gallastegui and Simon Moore. Syrian Eyes members sent the following images showing the sort of things the money was used to purchase in December. C’est avec une grande tristesse que nous annonçons que nous ne poursuivrons pas notre voyage Sail4Syria. Pour diverses raisons, y compris la logistique et le financement, nous avons décidé que ce ne est pas raisonnable pour nous de poursuivre ce voyage. Nous tenons à dire un grand merci à tous ceux qui nous ont soutenus dans notre voyage. Nous ne aurions pas pu aller nulle part sans toute la grande aide et le soutien de tant de personnes différentes. Merci également à toutes les personnes qui ont fait un don à l’appel de Syrian Eyes. Au total, nous avons recueilli €2351.75 pour Syrian Eyes. En Décembre nous avons envoyé la moitié de l’argent amassé à Syrian Eyes s (pendant la tempête de l’hiver très rigoureux dans la vallée de la Bekaa). Nous allons envoyer les fonds restants sous peu. Maria Gallastegui et Simon Moore. Les Membres de Syrian Eyes syriens ont envoyé les images dessus pou montrer les differentes choses qui ont été achetées avec cet argent. Syria Peace & Justice and friends will hold a vigil on Wednesday 15 April, from 6.30 to 8pm outside the National Gallery at the north end of Trafalgar Square. We will remember the victims of all massacres in Syria, not least the 45+ people – a number of them women and children – brutally killed during the assault by the Islamic State on the village of al-Mab’ojah, near the city of Salamieh, Hama province, on 31st March, 2015. 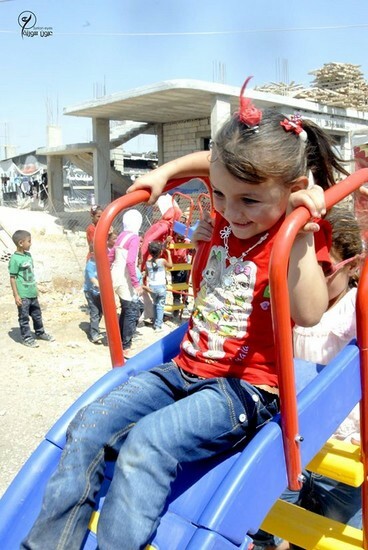 We will also remember all the civilians and combatants on all sides killed, injured, displaced, kidnapped and tortured during the brutal 4-year-old conflict in Syria and express our hope that the fighting will come to an end soon. Feel free to bring candles. 1. The death toll of the massacre committed by IS in al- Mab’ojah village rises to 45 people. Pour une traduction française se il vous plaît cliquez ici. On the helpful and intelligent advice of seasoned sailors, Sail4syria is taking a pause for winter for the next few months. This is due to the winter setting in and the difficulty of sailing on the Mediterranean Sea during this period. 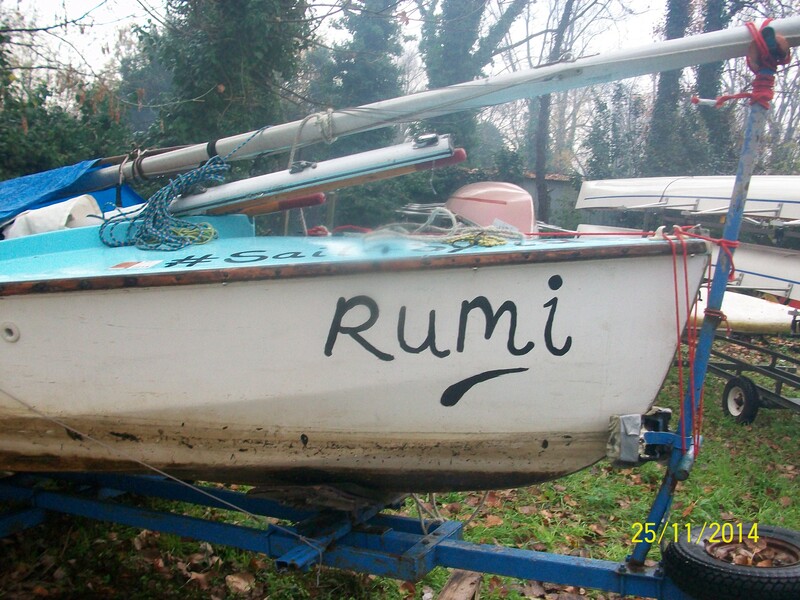 ‘Rumi’ is now in safe storage next to the River Rhone, a few days from the Mediterranean Sea. We will continue to update our plans and movements for Sail4Syria via this website. In the meanwhile be sure to follow the excellent work of Syrian Eyes and other similar groups who are dedicating their energy and time to helping some of the 11 million displaced Syrians who are surviving in extremely harsh, challenging and life threatening conditions right now! Next Monday in London, Syria Peace & Justice will be holding a Syria Solidarity Evening to raise funds for Syrian Eyes. For more info, please scroll down the page. A big ‘Thank you’ to all those people who have supported Sail4Syria thus far. We could not have reached this point without considerable support and co-operation from a long list of people, associations and groups. Maria and Simon are now returning to London for winter. Rumi on the Rhone + a motor which we were lent by a very kind man from Lyon. Without this motor we were forbidden to proceed through the locks of the Rhone. Syria Peace & Justice is proud to present a fundraising evening in support of Syrian refugee children in Lebanon, including a screening of the recent feature-length eyewitness documentary Return to Homs, a Sail 4 Syria update, and a talk about the excellent work of Lebanon-based Syrian refugee support group Syrian Eyes. We look forward to seeing you there. Bring all your friends, and don’t forget your wallet / purse! 6.45: Film: Return to Homs (90min), followed by discussion. *ENTRY TO THIS EVENT IS FREE* – You are welcome to join this event even if you can’t afford to make a donation. All proceeds go towards our Syrian Eyes appeal (minus a donation to our hosts for use of the venue). Pour une traduction française du site se il vous plaît , cliquez ici. It is over 4 months since we departed from London. Since then we have travelled over 1200 KM (Kilometeres sounds better than the miles version!). 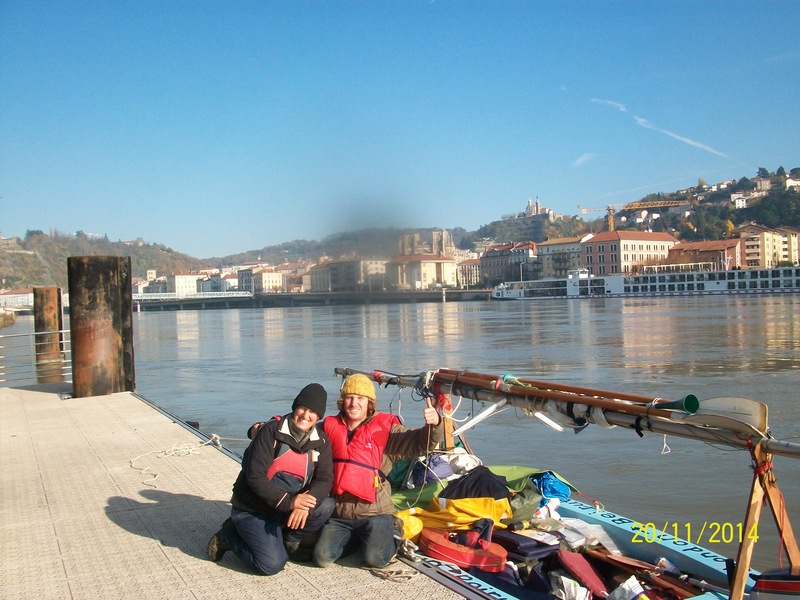 Most of this has been spent rowing through the canals and waterways that traverse France. We arrived in Lyon just over 1 week ago. Its impossible to predict what will happen when you arrive anywhere but so far we have consistently been greeted with warm and kindness by people with have encountered. Without this support we would not be able to continue. 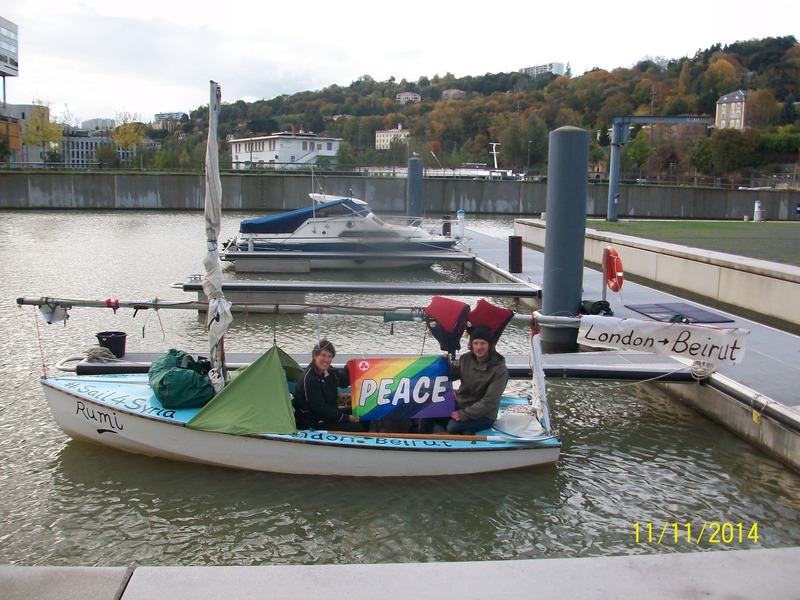 Prior to arriving in Lyon we stopped in Macon, a town of 200,000 people which is next to the Saone river. During our stay in Macon we had a chance to carry out a small peace vigil for Syria. It was a good oppurtunity to talk about the project with people who we encountered. ‘Mouvements pour le paix’ ( Movement for the Peace. It was a good oppurtunity to meet activists who share the same views on the situation in Syria and the Middle East and who propose a peaceful response as well. On Saturday 15th Nov, we attended the ’11th Village of International Solidarity’ in the Place Bellcour in Lyon. This years theme was on the subject of farming: supply and consumption. It was a very positive event with many great groups present who are working hard to solve many issues including sustainable food production, climate change and equality for farmers. We were able to share a stand with a kind group and collect some messages of peace and solidarity with the Syrian people from those in attendance. After this we held a very peaceful and positive vigil for peace and justice for those in Syria in the Place Bellcour with the Lyon member’s of ‘Le Mouvement de la Paix’. Almost all people we meet share the view that continuing to pour weapons in the Syrian conflict and the Middle East will not bring peace. Please scroll down for the English translation. Il y a 3 ans, le peuple syrien manifestait pacifiquement pour revendiquer le droit de vivre libre et dans la dignité. Dés lors, ce même peuple, notamment les enfants, n’a cessé de vivre dans l’horreur des combats entre les différentes parties ; 3 longues années de destruction d’un peuple, d’un pays et de son patrimoine culturel, qui ont provoqué une grave crise humanitaire. La population est prise en étau entre la répression féroce du gouvernement et les opérations armées de milices soutenues et armées par des forces extérieures qui ont détourné les revendications légitimes du peuple syrien. Les résultats des négociations de la conférence de Genève 2 ont été décevants. Chaque partie restant sur ses positions, aucune décision marquante ou permettant une sortie de crise rapide et pacifique n’a été prise. Nous exhortons les différentes parties à déposer les armes. Le conflit en Syrie ne pourra être résolu que par la voie politique et non militaire. C’est à cet objectif que doit travailler obstinément la France. • La saisie du Tribunal pénal international pour les crimes de guerre. 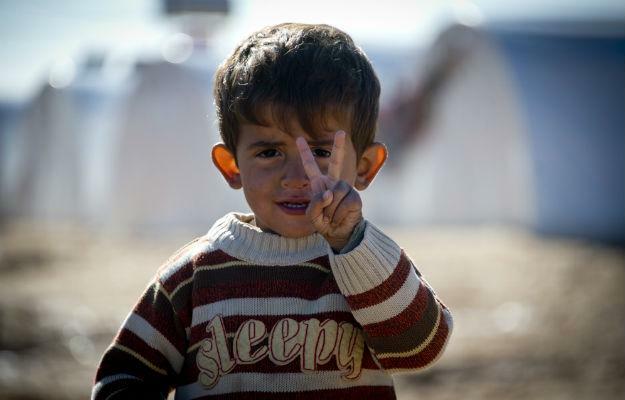 The Syrian People deserve peace. 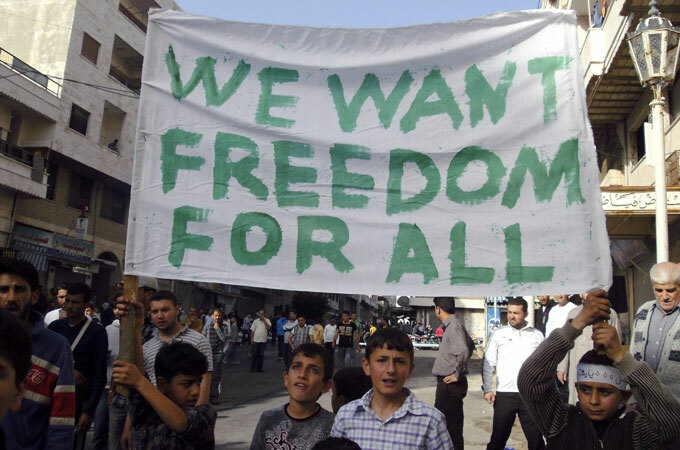 It has been 3 years since the Syrian people demonstrated peacefully to demand the right to live in freedom and dignity. From then on, the same people, including children, have continued to live in horror of the fighting between the various parties; 3 years of destruction of a people, a country and its cultural heritage, which has caused a serious humanitarian crisis. The population is now caught between fierce government repression and many groups armed by external forces who have hijacked the legitimate demands of the Syrian people. The results of the negotiations of the Geneva Conference 2 were disappointing, with no significant decision to resolve the crisis quickly and peacefully being taken. We urge the various parties to lay down their arms. The conflict in Syria can only be solved by political rather than military means. It is with this objective that we must work persistently in France. We call for non-violent action to challenge those foreign governments who have allowed the conflict to intensify and encourage a peaceful approach to the crisis in Syria with the help of the international community. • Entering the International Criminal Tribunal for war crimes. Ce samedi à 18 heures à la Place Bellecour à Lyon , il y aura une manifestation pour la paix dans la solidarité aux personnes touchées par la crise en Syrie et au Moyen-Orient . La manifestation est organisée par les membres du projet Sail4syria Maria et Simon qui font partie d’un groupe basé à Londres a appelé la Syrie : la paix et la justice . This saturday at 6 p.m in the place bellecour in Lyon there will be a peace manifestation in solidarity to those affected by the crisis in Syria and the Middle East. The manifestation is organised by Sail4syria project members Maria and Simon who are part of a London based group called: Syria Peace and Justice.